185 (OEM) Series vs 205 Series Tire? “P” simply means passenger rated. It refers to loading. No the P is to tell you that it has a raised curbing band on one side. the P is for Protection. If we are referencing the “P” before the section width it refers to tires that are primarily designed for passenger car use. P = When a tire size begins with a “P,” it signifies the tire is a “P-metric” size that was designed to be fitted on vehicles that are primarily used as passenger vehicles. This includes cars, minivans, sport utility vehicles and light duty pickup trucks (typically 1/4- and 1/2-ton load capacity). The use of P-metric sizes began in the late 1970s and they are the most frequently used type of tire size today. If there isn’t a letter preceding the three-digit numeric portion of a tire size, it signifies the tire is a “Metric” size (also called “Euro-metric” because these sizes originated in Europe). While Metric tire sizes are primarily used on European cars, they are also used on vans and sport utility vehicles. Euro-metric sizes are dimensionally equivalent to P-metric sizes, but typically differ subtly in load carrying capabilities. If, on the other hand, we are talking about the “P” after the XVS" in Michelin tires that “P” means the tire has a protective area built in to the tire to protect the rim from curb rash. 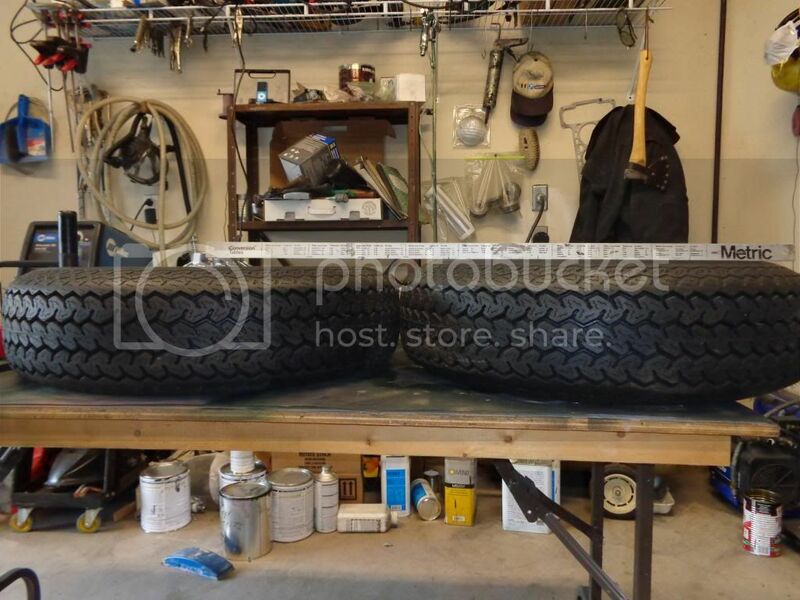 https://www.cokertire.com/185hr15-michelin-xvs-p-curb-guard.html It depends where the P is…for the XVS it means PROTECTION. Coker also shows a 185/70 15 XWX - looks to be 1/2" wider than the XVS - which may be a compromise? This link shows all the good 185R15 tyres that you would consider for an XKE. https://www.longstonetyres.co.uk/tyres/185-15.html If you click on a tyre then it will give you all sorts of extra details about the tyre. such as heighth and width. but the heighth will be approximately 10% of 185mm smaller in radius. also as you start getting lower like this then the tread is often a little wider in relation to the section width. But that is not such a great issue, if you stick with period tyres, but as you get more modern and lower it becomes more of an issue. However 185/70R15 is totally wrong for an e-type. I know some of my competitors recomend it, but they are wrong. 205/70VR15 this page shows all the tyres we would sell in this size. https://www.longstonetyres.co.uk/tyres/205-70-15.html again click on a tyre it will show you the distention, which again vary from brand to brand. However 70% of 205mm is 143.5mm is about the same as 80% of 185mm = 148mm (ie not 70% of 185mm). which amounts to about the same diameter of tyre as the original 64.0_15 Dunlop RS5 which was 683mm when Dunlop still made it. On this film it shows you all the tyres that we recomend https://www.youtube.com/watch?v=cioJAe2t8F4&list=PLORxf0xWk2NAz0J53D0dlFGi8rWwUOHYj&index=3 you can see the differences in tread width, and see the tyres in tthe flesh. But if you want to get yoour hands on them come and see us or arrange t o meet us at a VSCC race meeting. 205/70 tyres are over tyreing the car, which is why they didn’t fit them to the e-type in 1968 when it came out but waited until they fitted powersteering. there is a phenomena now where people are keen to fit a 205/65 or a 215/65 tyre or something of that ilk, because it is cheaper. The feeling that it is better is understandable, because of the perception that a modern tyre is better, which in some ways is true, but not for an e-type. a modern tyre suits different geometry. People then buy a new set of wheels, because you need a wider wheel to fit the lower profile tyre, which does cost less but will spoil your handling. Of course because you are fitting a low profile tyre, you cannot use an inner tube. so you need a tubeless wire wheel. All cars that fitted wire wheels need inner tubes. I have seen too many failed tubeless wire wheels to trust them. Any tyre a discerning driver would want to fit to these cars would not be less than 70% profile. This is obviously a matter of opinion and one that I struggled with, but eventually I opted for the the original 185 tires and I have never regretted it. The car handles wonderfully and has a light responsive feel while cornering and at speed. There is really nothing that has to be improved upon, either in terms of performance or appearance, if you are not racing the car. And as someone who was taught to drive without power steering, it was common knowledge that it was much easier to turn the wheel, and better for the tires, suspension, steering gear etc. if the car was rolling while the wheel was turned. Thanks for the informative videos and discussion. I have just ordered the Pirelli Cinturato CA67 in the 185VR15 based on your discussions and recommendations from my local shop. They were pretty dear, but good tires (tyres) are insurance you collect on. I bet You love them. 185HR15 Vreds on 6” wheels is the way to go, IMHO. So Nick, the wider wheels show the intuitive advantage of more tire on the ground, ie. greater traction. Mr. Longstone’s narrative is that situation is not the advantage it may seem to be. I have a tough time rationalizing that. But my Bridgestone 205x65x15’s on 6" daytons grip is far beyond my balls for street driving. So how does your car handle? Can you drift it through the corners like a Goodwood racer? I remember putting Pirelli Cintauratos on a Fiat and killing the fun factor because it stuck so well. Less is more? David, the advantage of the 185s mounted to the 6” wheels is the original footprint is maintained with a slightly stiffer sidewall. Tire on the ground isn’t changed from the original configuration. The lightness of steering is maintained (I will depend on @John_Walker1 to testify to that since he’s driven my E) with to my eyes an improved aesthetic. I have had 195 and 185 width tyres on my car. I couldn’t tell the difference between them. If I ever fit 205 width I’m sure I’d still not tell the difference on the road, even when parking. Maybe that’s because I cut my driving teeth on cars that had no power steering, and have always made sure the wheels are rolling when I turned the steering wheel. I don’t ever drive at the limit of the tyre’s adhesion. Given today’s traffic that would be stupid, and given the traffic laws in Blighty I’m sure my licence would become heavy with endorsements. If I wanted to put it on a track (I never will, but…) I’d change the tyres for more suitable compounds widths and profiles, and the suspension to reduce roll. So the only reason I’d change tyres for a wider tread would be to make the car look less inept, to fill the wheel arches, to make it look more planted on the road. Make it more boxer than ballerina. The E-Type never was a wimp, but it needs to look the part. Wider tyres will do that. 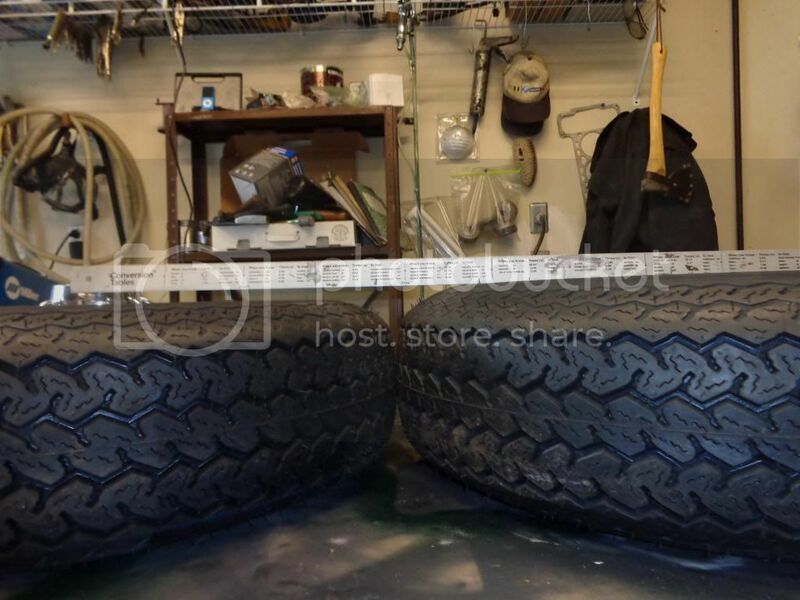 205/65R15 is too small in diameter (5% of 205mm = 10mm radius. nearly an inch in diameter. When you change tyres. the ones you take off might easily not be up to pressure. so if you take off a 185 that is slightly low in pressure and fit a 195 at the correct pressure arguably the 195 could feel lighter. One of the other things that makes tyre comparisons difficult is you take off old rubber and fit new. The science tells us that a period 185 is better on these cars. and a 185R15 Cinturato will not stop you as well in a straight line as a modern tyre like a 205/65, and you may have less wheel spin with a wider tyre. However in the corners a 185R15 Cinturato will be miles better because it is thinner with a more rounded cacrass, where your modern tyre will lift the inside edge and the loss of grip will be more sudden. Back to the tyre comparison. if you take off an old perished, low pressure 185 and fit a correctly inflated 195 or 205 section tyre you might not so much feel it is a bad thing. However one thing i think i can very confidentially say is that everyone that takes off wrong size tyres and fitts either 185Vr15 Pirelli Cinturato or 185VR15 Michelin XVS is over the moon with it, they love the feel of the car being the way it should be. Has anyone ever made this transfer back to the good stuff and not been really pleased with the results? Most of the period photos that I have seen of E-types in race trim show wide, modern rubber…definitely not 185s at all four corners. The factory offered (recommended?) a 5.5 inch wheel at the rear and the very early race cars appear to have front tire diameter of the same size as a 205/65 and the rear diameter the same as a modern 205/70. I believe David Alhers post above is on the mark. The 185 tires give the vintage “feel”…along with the loss of grip and slip when cornering fast. Dollars to donuts the actual grip is far less than a modern tire. You get to feel like boy racer, but the car is relatively speaking…slow. Another anecdote…the fast autocross cars in recent years do not use 185 tires. My experience with 205/65 V rated Sumitomos on the front is that they provide massive grip and instant steering response …akin to my old Lotus Elan on shaved Pirelli P7s on 6" wheels back in my autocross days. The lightness of steering is maintained (I will depend on @John_Walker1 to testify to that since he’s driven my E) with to my eyes an improved aesthetic. I’d judge your car as very well sorted, obviously well maintained and quite a joy to drive. Yes, I noted the steering was lighter than my FHC with its 205s. everyone that takes off wrong size tyres and fitts either 185Vr15 Pirelli Cinturato or 185VR15 Michelin XVS is over the moon with it, they love the feel of the car being the way it should be. Since getting a 185 or 195 with the correct diameter and a REASONABLE price isn’t easy, especially if you want easy replacement in case of damage and some assurance that they are made well (low production, some issues in the past), a “205” just makes sense. I don’t want to hear about “how valuable our cars are” and " a small price to pay" - some of us just don’t want to get screwed buying what may be a less modern and less well engineered item. We need the diameter. I actually think this is one of the biggest issues. Tires are a very ‘black art’ - we really don’t know how well made a darn near reproduction tire is. We do know a modern 205/70 is made in large numbers and with modern concepts. If Honda Accords start coming with 185R15’s then maybe we’d have some choices. I’d love some perfect Michelins - what I don’t know for sure is if those particular tires are really any good - they stink of “reproduction” and smell of ridiculous cost. What they raced on in period backs up what i’m saying. they were using crossply tyres with an utterly different carcass structure to the radial tyres we are talking about so the tread flexes as well as the side wall. 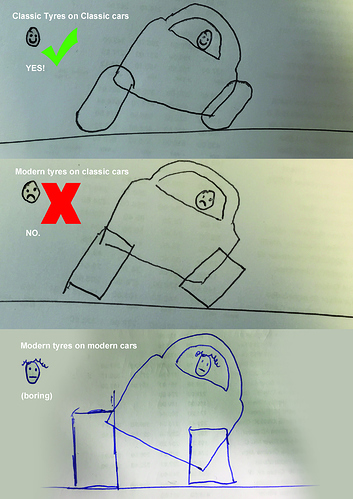 but your modern low profile tyres don’t flex so much in the tread which is why they react as they do in my earlier drawing lifting the inside of the tread off the road as it rolls in corners giving it suudden loss of grip rather than progressive as it would with a period carcass 185 tyre. If you are going racing, lower the car, stiffen the springs and importantly give it adverse camber. whjich don’t make for such a nice road car. I believe David Alhers post above is on the mark. The 185 tires give the vintage “feel”…along with the loss of grip and slip when cornering fast. Dollars to donuts the actual grip is far less than a modern tire. No it is not. not on your chassis, unless you make the modifications mentioned above. Maybe on a test machine it will give more grip, but what we are talking about here is how the foot print of your tyre is presented to the road, And with an old car it is not right for wide low modern tyres. [quote=“64etype, post:33, topic:372356, full:true”]You get to feel like boy racer, but the car is relatively speaking…slow. Another anecdote…the fast autocross cars in recent years do not use 185 tires. My experience with 205/65 V rated Sumitomos on the front is that they provide massive grip and instant steering response …akin to my old Lotus Elan on shaved Pirelli P7s on 6" wheels back in my autocross days. a fast Autocross car has had it’s chassis geometry changed for racing as mentioned above. and what suits one of those cars has got nothing to do with what makes a good road tyre. Yes they are easy to get. here is the crux of the matter “reasonable price” No they are not cheap, but they are made by Michelin and Pirelli. It has nothing to do with the value of the car. (I just put £ 800 worth of Brakes and £ 800 worth of tyres on my £ 3,500 2001 XJR). an e type is a very powerful car and tyres for fast sports cars don’t come cheap, specially when they are top quality. yes if you are modifying your car, or going racing, or just want to buy a tyre that is cheap, then maybe 205/65R15 is right for you, and i am glad that larebob has been frank enough to clarify it is just about price. However for a nice, non power-steering road car, 185VR15 Cinturato or XVS are the nicest tyres. Longstone, Where do you stand opinion wise on the Vredestein185 that many here are using? Thanks for all the interesting comments & information. I’ve decided to go with the 185 Perelli C when the time comes. Go with the best and worry less. Do the Michelin 185VR15 XVS tires require tubes? Coker says yes they need tubes and Longstone Classic Tyres say they are Tubeless. I’'m looking to buy some soon so would like to know. Without doubt, the 185VR15 Michelin XVS tyres currently in my stock are tubeless tyres,Also the current Michelin brochures state tubeless. I have also encouraged Michelinto make all the XAS range tubeless. This web page gives you most of the specification about these tyres. https://www.longstonetyres.co.uk/tyres/185-15/185vr15-michelin-xvs.html However if you do spot mistakes on our web site please let us know. I am not a fan of the Vredestein, I think when they were cheaper then i understood people buying them. we do not tend to sell so many any more. however when we did sell more; we got quite a few complaints about the dents in the side wall. Then of course there is the look. they don’t look very good. they have all sorts of modern detail on the side wall. the tread doesn’t look period, because it isn’t, and then the write the word “Classic” on the side wall. The only reason to buy the Vredestein is price. I haven’t driven a Jag on them, but i have driven an Alfa Spider on them which we put XAS on. Wow worlds apart. I owned a V8 Daimler which i also fitted with 180HR15 XAS, again fantastic https://www.longstonetyres.co.uk/classic-car-tyres/daimler/v8-saloon.html .I have also been in an XK120 fitted with Vredesteins. we then Fitted Cinturato on Borrani wheels. I wasn’t driving, but the driver (and owner of the car) just loved them.